Before :- S. Natarajan And Kuldip Singh, JJ. Criminal Appeal No. 86 of 1979. D/d. 7.4.1989.
of the Arms Act and sentenced to undergo RI for 6 months on each count, the sentences to run concurrently with the sentence of imprisonment for life. 2. The appellant has been awarded conviction for the offences mentioned above in the following circumstances. At about 9 or 10 p.m. on 8-5-1975 the appellant and deceased Manjit Singh, who were both aged about 18 years had a quarrel while taking curd and while in a drunken mood near the shop of one Mohinder Pal in Kharasanwali Gali, Amritsar. PW 2 Ramesh Chand and PW 3 Subhash Chander intervened and pacified them and sent them away. While the appellant went away to his house Manjit Singh went to the new market and lay down on a bench. Some hours later i.e. at about 3 or 4 a.m. on 9-5-1975 PW 2 was awakened by the appellant and enquired as to where Manjit Singh was. PW 2 took the appellant to the new market which was only about 9 or 10 yards from where PW 2 was sleeping and pointed out Manjit Singh sleeping on the bench. At once the appellant caught hold of the hair of Manjit Singh and pulled him down to the ground and thereafter beat him on his head 3 or 4 times with an iron rod brought by him. Not stopping with that, the appellant took out a knife brought by him and inflicted two or three stabs on the chest of Manjit Singh. Manjit Singh died almost instantaneously on receipt of the injuries inflicted on him by the appellant. The appellant warned PW 2 that if he told anyone of what he had seen he would also be dealt with in the same manner and then left the place. 3. PW 2 went back to his house and dozed off for some time and thereafter went and informed PW 3 at his house as to what had happened. PW 3 went to the New Market along with PW 2 and saw the dead body of Manjit Singh lying there. He advised PW 2 to inform the matter to one Jagan Nath and on PW 2 informing Jagan Nath he was asked by the latter to inform one Kartar Chand, Municipal Commissioner about the occurrence and accordingly PW 2 went and informed Kartar Chand. Thereafter it is said that Kartar Chand took PW 2 to the police station and PW 2 lodged the first information report. 4. On the basis of PW 2s report a case was registered against the appellant and was duly investigated. The appellant was not immediately traceable but later in the day he was apprehended near the bus stand and on being questioned he gave a statement leading to the recovery of a blood- stained knife from a place of concealment in his house. 5. Manjit Singhs dead body was sent for autopsy and PW 1 Dr Gurdip Kumar Uppal, who conducted the autopsy found two incised injuries on the chest, another incised injury on the upper part of the left ear pinna and three contused injuries on the forehead and both sides of the head. Besides there were also abrasions. The stab injuries on the chest and the injuries on the head which had caused fracture of the left parietal bone were certified by PW 1 to be injuries sufficient in the ordinary course of nature to cause death. 6. The appellant was duly charged and tried for the offence of murder. The appellant denied his complicity in the offence and stated that PW 3 and the Municipal Commissioner Kartar Chand were engaged in doing satta gambling and deceased Manjit Singh was their henchman and because he (appellant) and some others had raised objection to the satta gambling activities they have all joined together and falsely implicated him in the case. 7. The Sessions Judge accepted the prosecution case and rejected the plea of the accused and convicted him under the respective charges framed against him and the High Court confirmed the convictions and sentences. 8. Mr R.C. 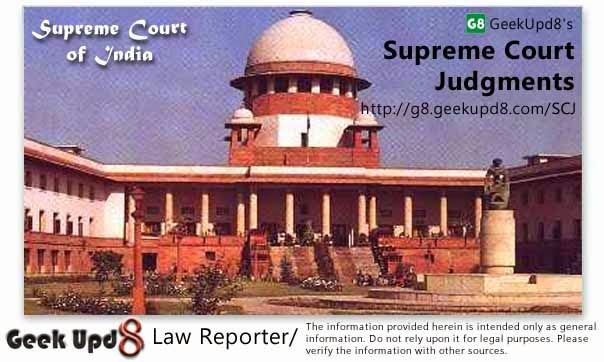 Kohli, learned Counsel for the appellant has taken us through the evidence in the case and the judgments of the Sessions Judge and the High Court and advanced various arguments to contend that the prosecution case is full of infirmities and as such the Sessions Judge and the High Court were in error in accepting the prosecution evidence and convicting the appellant under the several charges and awarding sentences to him as set out above. Mr R.S. Suri, learned Counsel for the State refuted the contentions of Mr R.C. Kohli and submitted that the prosecution evidence fully justified the conviction of the appellant. 9. On a consideration of the matter we find there are several factors which cast serious doubts about the truth of the prosecution case. In the first place, though there was a quarrel between the appellant and Manjit Singh at about 9 or 10 p.m. on 8-5-1975, it was only a drunken brawl and therefore it is doubtful if the appellant would have come to attack Manjit Singh some hours later to settle scores with him. If at all the appellant was aggrieved with the conduct of Manjit Singh, he would have attacked him soon after the quarrel had taken place and would not have waited till 3 or 4 a.m. to come and attack him. Independent material for this inference is furnished by the evidence of the doctor PW 1 who conducted the autopsy. PW 1 has estimated the time of death as 11 p.m. i.e. 16 hours before the autopsy was conducted. The High Court has brushed aside the estimate of PW 1 regarding the time of death by saying it is only an opinion evidence. Unfortunately the High Court has failed to take into consideration another relevant factor which would indicate the probable time of death. PW 1 had found semi-digested food in the stomach of Manjit Singh at the time of autopsy. He has therefore, stated that Manjit Singh should have taken his last meal 2/3 hours before his death. If the prosecution case is to be accepted then it would mean that Manjit Singh must have had his last meal at about midnight which is somewhat unlikely. According to PW 2 Manjit Singh and the appellant were taking curd at the shop of Mohinder Pal at about 9 or 10 p.m. and it was at that time the quarrel had taken place between them. After the quarrel was stopped by the intervention of PWs 2 and 3, Manjit Singh went to the New Market and lay down on a bench. Such being the case it is highly doubtful if Manjit Singh would have thereafter got up and gone somewhere and taken his food. The medical evidence regarding the time of death and the presence of semi-digested food in the stomach of Manjit Singh throws considerable doubt about the prosecution case that Manjit Singh had been attacked at about 3 or 4 a.m.
10. Leaving aside the question of the probable time of occurrence, the nature of the injuries caused on Manjit Singh also cast doubt about the veracity of PW 2s testimony. Manjit Singh had sustained stab injuries as well as contused injuries and therefore it is obvious that he must have been attacked with a sharp-edged instrument as well as a heavy blunt instrument. In fact PW 2 would say that the appellant attacked Manjit Singh with a knife as well as with an iron rod. It is highly improbable that the appellant would have brought two kinds of weapons to attack Manjit Singh. Moreover the iron rod could not have been brought by him in a concealed fashion. There is also no evidence as to what happened to the iron rod after the appellant had perpetrated the attack on Manjit Singh. The prosecution has been able to recover only a knife from the appellants house and not the iron rod. If the appellant had thrown away the iron rod it is doubtful if he would have brought the knife alone and kept it concealed in his house. Inasmuch as two kinds of weapons have been used the possibility of two persons having attacked Manjit Singh, as contended by Mr R.C. Kohli cannot be ruled out. 11. Coming now to the evidence of PW 2 it is not understandable why the appellant should have come and woken him up at 3 or 4 a.m. to find out where Manjit Singh was to be found. The place where Manjit Singh was sleeping was only about 9 or 10 yards from where PW 2 was sleeping. The appellant could have, therefore, easily found out where Manjit Singh was sleeping without waking up PW 2 and making enquiries of him. Even if the appellant had required the services of PW 2 to find out where Manjit Singh was sleeping, he would not have perpetrated the attack in the presence of PW 2. He would have sent away PW 2 before he launched the attack on Manjit Singh. 12. The conduct of PW 2 after the occurrence had taken place has certainly to be viewed with suspicion. If he had been a witness to the murderous attack on Manjit Singh, it would be natural to expect him to go and inform the parents and relations of Manjit Singh of the occurrence and also the police authorities. On the other hand what PW 2 had done was to go to his house and sleep for some time and then go and inform the matter to PW 3 and some others. The story of PW 2 that because of the threats of the appellant he did not go and inform anyone forthwith cannot be readily accepted. If he was so frightened at that time to go and tell others about the occurrence, it is not known how he was able to get over his fears a few hours later and go and inform PW 3 and others about what had happened. 13. Apart from the evidence of PW 2 which, as we have pointed out is not of an inspiring nature, there only remains the recovery of a blood-stained knife from the appellants house. It is no doubt true that human blood stains were found on the knife but it has not been shown that the blood stains on the knife were of the same group as the blood of Manjit Singh. 14. Thus we find that there are very many factors which raise doubts on the truth of the prosecution case. The prosecution case is rendered doubtful regarding the motive for the occurrence, the time and manner of the occurrence and as to whether PW 2 is a truthful witness. The Sessions Judge and the High Court have not adverted to these suspicious features and have accepted the prosecution case by placing unreserved acceptance on the evidence of PW 2. 15. In accordance with our conclusion, we allow the appeal and set aside the convictions awarded to the appellant and acquit him of the charges framed against him. As the appellant is on bail he need not surrender to custody and his bail bond will stand discharged.